Loup’s hydroelectric system begins five miles southwest of Genoa along Highway 22 at the Headworks diversion structure. Water from the Loup River is diverted into the District’s man-made canal which flows through the Monroe facility. The water continues it’s eastwardly flow until it reaches the two 1,100 acre regulating reservoirs north of Columbus known as Lake Babcock and Lake North. These reservoirs provide storage for generation at the Columbus Powerhouse and recreation for the public. After generating power, the water re-enters the canal, known as the Tailrace section and flows south into the Platte River. The Columbus Powerhouse, one of the largest water-powered generating plants in Nebraska, has three turbo-generators with a total nameplate rating of 45,600 kilowatts. The Monroe Powerhouse has three turbo-generators with a total nameplate rating of 7,800 kilowatts. These powerhouses operate 24 hours a day, seven days a week, 365 days a year. These two facilities generate in excess of 150.0 million kilowatt hours annually. 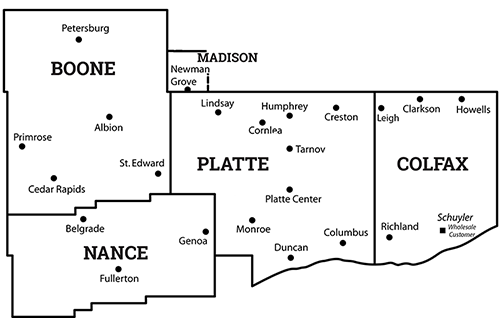 Loup serves 21 Nebraska communities with a total current population of approximately 62,300 people. The total service area covers 2,219 square miles and consists of 794 miles of transmission and distribution lines. In addition, the District sells electric power to one wholesale customer. We have distribution system lease and franchise agreements with all the municipalities that provide for the continued operation of their distribution systems until the expiration of the agreements. Under these agreements, the District retains the responsibilities of ownership and/or operation, including the obligation to meet the costs of property additions and maintenance. The Board sets sufficient electric rates to pay the cost of operating, maintaining and repairing the transmission and distribution systems.